Stem executes on its strategy of bringing lots of distributed storage systems together as one resource. When it comes to playing a role on the power grid, size -- or shall we say, scale -- matters. Distributed energy resources like solar panels, smart thermostats or behind-the-meter batteries come in small packages. But utilities and grid operators want participants to pull together megawatts, or at least hundreds of kilowatts, of resources to play into grid services like frequency regulation or demand response. Tying together distributed resources to meet these scale requirements is both a technical and a policy challenge. First, we’ve got to prove that lots of independently located and controlled systems can respond as a unit. Second, we’ve got to create the grid programs and market mechanisms that permit these aggregated resources to play the roles this capability opens up to them. On Tuesday, startup Stem marked a milestone in these efforts, announcing that it’s actively bidding a collection of its behind-the-meter battery systems into a pilot demand response program with California’s grid operator, CAISO. It isn’t the first time multiple energy storage systems have been aggregated in this fashion, but it may be the first time they’re actively being paid for that service. And while it’s just a pilot at present, Stem is hoping that its experience will help convince California utilities and energy regulators to open more opportunities for distributed energy storage, both for itself and for the long list of would-be distributed storage players like SolarCity, Green Charge Networks, Sunverge, Coda Energy and others active in the state. The idea was to prove, “using the structures and the rules in place, how can we get into the market faster, and show that behind-the-meter distributed storage can be an asset to the system,” Tad Glauthier, Vice President of Customer Development at Stem, told me in an interview this week. It’s all part of utility Pacific Gas & Electric’s Intermittent Renewable Management Pilot Phase 2 (IRM2), which allows participants to earn capacity and wholesale payments through CAISO’s Proxy Demand Resource (PDR) product, one of California’s demand response programs. All that’s needed to join is the ability to aggregate at least 100 kilowatts of curtailment within a single CAISO-defined region, and bid that resource into day-ahead markets at a price that can beat the wholesale energy prices on that day. Using its systems installed at the InterContinental hotels in San Francisco and other sites, which range in scale from 18 kilowatts to 54 kilowatts, Stem has been able to commit up to 160 kilowatts of battery capacity for up to three hours for the day-ahead program, Glauthier said. At the same time, it’s been able to keep those batteries available for their primary purpose, to limit demand charges in the buildings they’re installed in, he said. That’s important, because Stem’s customers aren’t going to sacrifice demand charge reduction to participate in grid markets, he said. They’re also not going to be willing to join in a grid program if they’re not confident they can meet their daily promises for demand reduction without missing the mark and incurring penalties, he said. But they may well be willing to open those battery systems up to earning additional revenues from those markets, if Stem can prove that it’s able to handle both tasks simultaneously without exposing them to financial risk, he said. These concepts also describe the approach of a host of demand-side resource aggregators that are looking to gather more behind-the-meter energy assets into grid-ready blocks of power curtailment and adjustment. Energy storage plays a role in some of these efforts alongside more traditional end loads. Companies like Enbala Networks, Viridity Energy and Demansys in North America; REstore, Kiwi Power, and Entelios in Europe; and Panasonic and Hitachi in Japan are building platforms to take advantage of the availability of behind-the-meter batteries. There are a lot of reasons to predict that California will be a key market for bringing aggregated energy storage to the forefront. The state’s unprecedented mandate to bring 1.3 gigawatts of energy storage to the grid by 2020 includes a significant set-aside for customer-site storage, putting pressure on utilities and regulators to find ways to allow it to participate at meaningful scales. California’s booming solar PV landscape also demands new approaches to manage the challenges that lots of on-again, off-again rooftop solar power brings to the grid -- and battery-backed solar systems could be an important part of that solution. 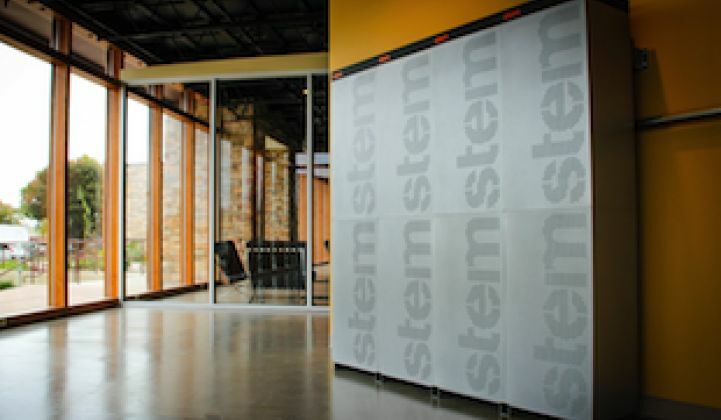 Indeed, while Stem is the only participant in the IRM2 pilot that is using batteries right now, “I would be surprised if other energy storage companies weren’t looking into grid services,” he said. GTM Research predicts that the U.S. behind-the-meter energy storage market will grow to surpass 720 megawatts by 2020, driven by rising demand charges, grid reliability issues and the growth of distributed renewable energy. Stay tuned for more announcements along these lines, as distributed energy storage grows to meet the challenges of the grid edge.